Thousands of DREAMers want nothing more than the opportunity to get a college education and give back to their families, their communities, and this country. 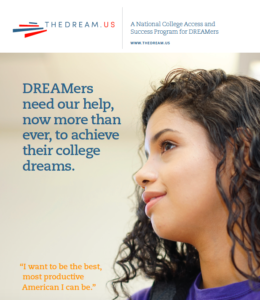 DREAMers are inherently motivated and resilient students who want to earn a college degree and make a difference in the world. Through a rigorous selection process, we select Scholars who have demonstrated the ability to succeed in college and in life. Our goal is to fund 5,000 DREAMer Graduates. Over 70% work to support their college education and sometimes their families! 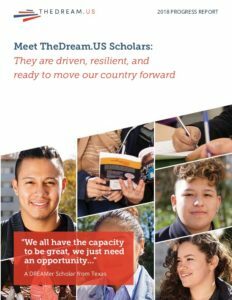 We partner with over 70+ colleges whose leaders are committed to addressing the barriers and challenges DREAMers face in getting into and through college. Each of our Partner Colleges has an on-campus Scholar Advisor who builds meaningful relationships with our Scholars – individually and as a cohort – and assists our Scholars in successfully navigate their college journey and access any needed services. Our Scholars connect and support each other locally on campus and as part of a national Facebook community. They — better than anyone else — understand each other’s journeys and what it takes to succeed. We provide leadership development, internship, and mentor opportunities, so they can grow together. See our latest report on how our Scholars are doing. 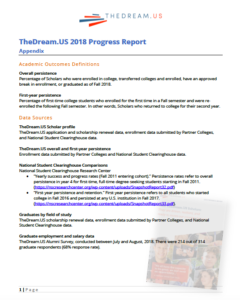 Our dreamer scholars are exceeding national college success rates. And they are determined to make a difference in the world.